We have expertise in offering several types of hand gloves which is made of soft, stretchable and skin friendly materials. with excellent physical and chemical properties these gloves are very effective in providing protection against solvents, petrol, aromatic solvents, fatty acids and others in chemical and food processing plants. These gloves are available in various sizes and specifications. 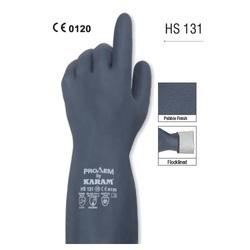 They are Nitrile coated nylon gloves which are CE Marked. 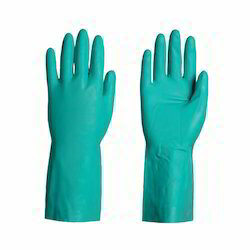 We offer Nitrile Coated Nylon Gloves CE Marked that have satin unlined interior for user comfort. It also has extended length for more hand safety & protection. 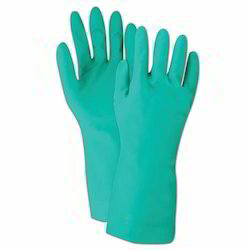 These Nitrile gloves have outstanding physical strength and better resistance against a wide range of chemicals. The raised pattern at palm on gloves provides better & non skid grip. With the use of cutting edge innovation and imaginative machines and devices, we offer an expansive collection of Nitrosol Chemical Resistant Hand Gloves generally utilized as a part of synthetic industry. These gloves are broadly requested by the customer for their huge elements, for example, profoundly agreeable and tear resistance. 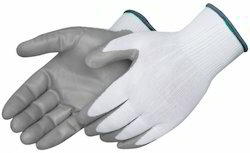 These gloves are checked under the heading of our deft experts, with a specific end goal to guarantee impeccable supplies at our customer's end. Provides protection against caustics, detergents, acids, alcohols and many ketones. Contoured palm and ergonomically designed curved fingers for a soft comfortable fit. Soft flock lining which absorbs perspiration and feels comfortable while exposed to solvents. Various finishes for improved wet grip. We are an one of a kind element in the business, effectively dedicated towards offering an ideal quality scope of Nitrosol Chemical Resistant Hand Gloves CE Marked. These wellbeing hand gloves are sourced from our dependable merchants. The offered security hand gloves are broadly utilized for the assurance of clients from risky chemicals, blazes, wounds and cuts. Attributable to their ideal non-abrasiveness and tear resistance, the gave wellbeing hand gloves are exceptionally requested among our customers. Offered Neosol Chemical Resistant Hand Gloves CE Marked are designed by our team of experienced and skilled professionals with the aid of latest machinery. In addition to this, offered gloves are available in various designs, sizes. Resists a broad range of chemicals. Acid, caustic, oil and solvent resistant. Gloves are case hardened increasing wear, abrasion resistance and chemical resistance over other ordinary neoprene gloves. Contoured palm and ergonomically designed curved fingers make for a soft, comfortable fit. 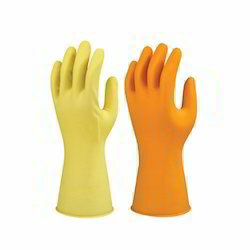 We offer extensive variety of Chemosol Chemical Resistant Hand Gloves CE Marked. Our items are generally refreshing among the customers for its ideal quality and toughness. These items are skin well disposed in nature and shield the hands from unsafe chemicals and reagents. These items are accessible in distinctive shapes and sizes and can be modified according to the customers' prerequisite. Our 2 dip process allows for a blend of neoprene and natural rubber over natural rubber, increasing the level of protection in a broad range of chemicals. 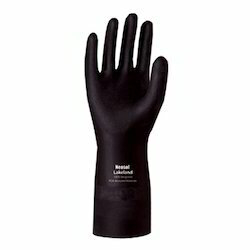 Provides a level of versatile chemical resistance compared to conventional single dipped gloves. 13" length is longer than most other gloves for added protection. An economical option-cost savings idea over other types of chemical resistant gloves. Contoured palm and ergonomically designed curved fingers for a soft, comfortable fit. "Soft flock lining absorbs perspiration and feels comfortable while exposed to solvents. Raised diamond pattern provides a better grip while handling wet or dry areas. 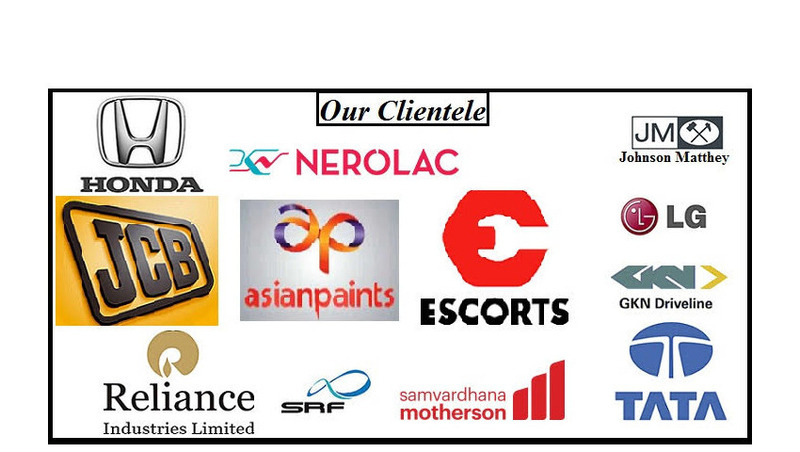 We are manufacturer are supplier PU coated safety gloves.